REACH Out to Puerto Rico & the U.S. Virgin Islands for the holidays! The recent hurricanes devastated Puerto Rico and the U.S. Virgin Islands, causing billions of dollars in damage, lost lives and leaving families exposed to dangerous conditions, without safe housing and water, and lacking the necessary infrastructure to thrive. The task at hand is overwhelming as those in the U.S. Caribbean territories struggle to rebuild their lives and stabilize their future. You can help can make a difference. 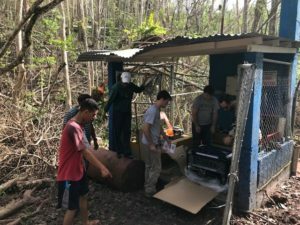 RCAP Solutions Staff with local water board members and members of the EPA and Water Mission as they install a generator to bring power to a well house in the rural community of San Sebastian, PR. Click photo for full story and testimonial. Right now, RCAP Solutions is already helping those who have been devastated by the recent hurricanes. In the Caribbean, we have an experienced, technical assistance team in Puerto Rico, assisting municipalities with the tools to provide safe drinking water to residents and offering focused efforts in the areas of water, wastewater, infrastructure, and waste reduction programs. Locally, we are working with the state of Massachusetts on resettlement efforts for those individuals and families leaving Puerto Rico to establish residency in Massachusetts. RCAP Solutions is ready and able to meet the needs of those who so desperately need our vital services. Funds secured through our holiday campaign will be used to expand and continue these efforts by helping families and rural communities in need. Please give. You can make a difference today. AmazonSmile is a simple and automatic way for you to support your favorite charitable organization every time you shop, at no cost to you. When you shop at smile.amazon.com, you’ll find the exact same prices, selection and shopping experience as Amazon.com, with the added bonus that Amazon will donate 0.5% of the purchase price to your favorite charitable organization. Visit smile.amazon.com and select RCAP Solutions to receive donations from eligible purchases before you begin shopping. Amazon will remember your selection, and then every eligible purchase you make on AmazonSmile will result in a donation.